Stuck doors, cracked sheetrock, and broken brick may mean there’s a problem with your foundation. Here’s good news: repairs may not be necessary. Even if they are, they don’t have to be a disruptive mess. Du-West Foundation Repair offers methods which are convenient, quick, and guaranteed. Du-West only does work that’s necessary because needless work on a foundation can cause problems down the road. More than half the foundations Du-West checks annually don’t need repair. Instead, we’re able to help you with maintenance solutions such as watering, changing drainage, or installing root shields to head off more serious problems. 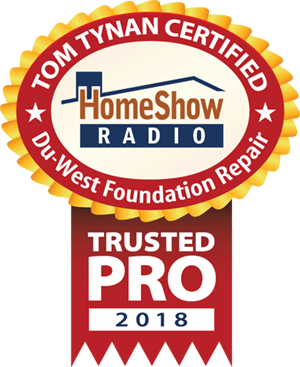 Serving the Greater Houston area, Du-West Foundation Repair is a trusted HomeShow Pro, certified by HomeShow Radio’s Tom Tynan. How can Du-West help you? • Houston House Raising: How High Is High Enough? • Is foundation repair tunneling a better answer for your home? • Is your home on failing support? • Are trees hurting your foundation?